Janette and I spend most of our week on a high protein diet. This inevitably means eating a lot of meat. I’m a proud carnivore, but I don’t like eating meat for every single meal. I have a few go-to, healthy meatless recipes like this that give up meat without sacrificing flavor. Seriously, it’s so savory that most people don’t even realize it’s vegetarian at first. In our house, when I make this, it signals the official start of Fall. I look forward to it every year! One of my favorite parts of this quinoa chili is how well it reheats. I don’t know about you, but I have a super busy Fall. Recipes that I can make in big batches and heat up as needed are a godsend. It also travels well, so you can easily take it to work or school for lunch. Maybe even bring it tailgating if you are looking for a healthier option? 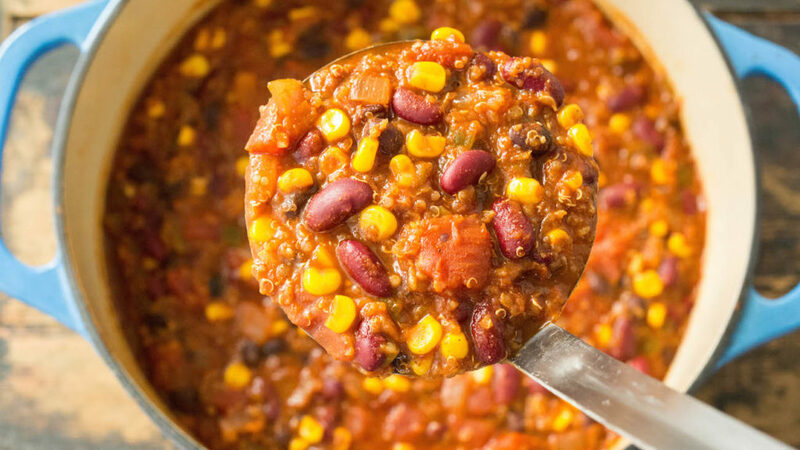 Between the corn, beans, and quinoa, this chili seriously fills you up. My eyes are often bigger than my stomach and I fill up my bowl a little too much. Half-way through, I’m astonished at how full I am from a vegetarian meal! I like to top my bowl with avocado, sour cream, and cheddar cheese. You can also add tortilla strips or chips for added crunch, or pico de gallo for even more tomato and onion flavor. Do you have any favorite chili toppings? Or any recipes you can’t wait to make when it turns Fall? Let us know so that we can all enjoy! Add olive oil to a cast iron pot over medium-high heat. Wait until it is heated, then add the diced onions. Sautée until they are both tender and translucent, 3-5 minutes. Add minced garlic and sautée 1 minute more. Add tomato sauce, diced tomatoes, quinoa, broth, green chilis, chili powder, cumin, cocoa, paprika, sugar, coriander, and cayenne pepper. Stir, then bring to a boil. Reduce to a simmer, cover, and cook for 30 minutes. Uncover and add all beans, corn, and lime. Stir and cook and until heated through. Top individual servings with sour cream, diced avocado, and shredded cheddar cheese. This looks fabulous! I love a good meatless chili, but you get so much protein from the beans and quinoa! I just printed this recipe out and I’m going to try it this week! Looks so yummy! 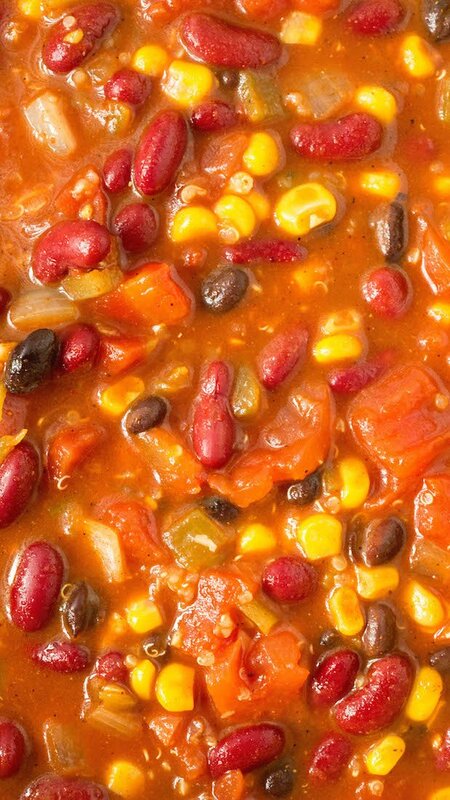 I love meatless chili. 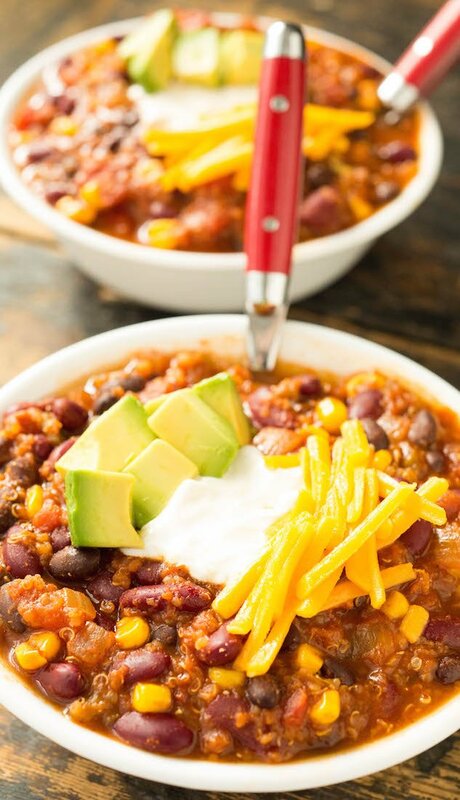 It still feels as comforting as traditional chili but feels so much healthier for you. This looks AH-MAZING. I love that it’s meatless what a great alternative to this comfort food recipe.